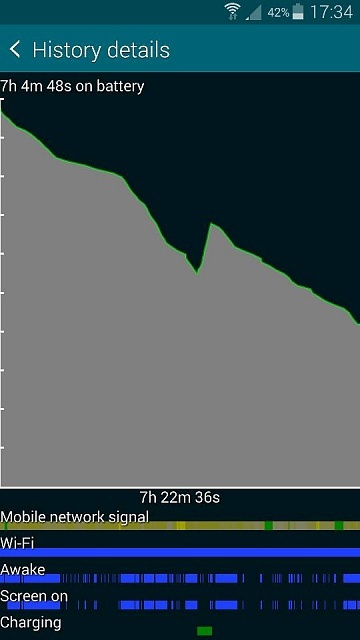 My battery. Is was immense. Would go through a whole day with 40% left at the end of it, no problem. All of a sudden, one day last week it has started to drain so quick, I have to charge it twice a day. I have done nothing different. I did install a couple of apps, Cloudmail (i think it's call) Sol Calender and have since deleted them in case they were the issue. I have done the usual thing, settings > battery to see what is happening but there is nothing abnormal. Screen at the top, android OS next. No apps seem to be causing it. I have that battery doctor app to see what could be doing it, but that rubbish as the apps you choose to stop running just start up again. What could have happened? Anything I can do or download to try and get to the bottom of it? 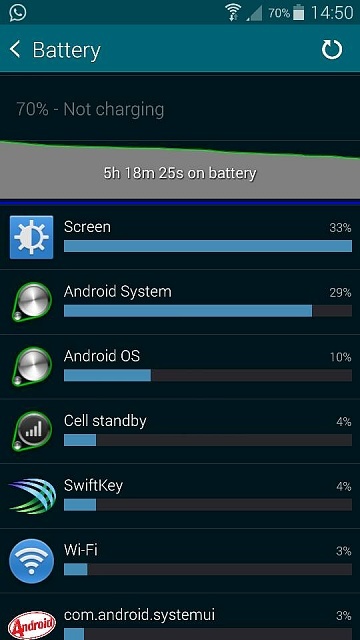 Well, do one thing try going to the settings> battery and check which application is consuming most of the battery I am pretty much sure that this will give you view that brief analysis of what is going on ! I had a similar thing happen with no new apps from my end. (Not having to charge twice a day, but just draining to nothing before I would usually plug in at bedtime.) One thing to try if you do not want to factory reset is change to ART runtime and then back to Dalvik in the developer options - this reconfigures all your apps without deleting any data or settings. I wound up installing the Qualcomm Snapdragon Battery Guru app, so I could stop the syncing of a bunch of apps, especially the Google apps, that I don't use in the background. (As a tangent, people complain about manufacturer/carrier bloatware, but I feel like Google's is the worst because they use a ton of battery and data for services I never use.) This seemed to help get me back to the battery life I was experiencing before. Tried that.... Heres a screenshot of what going on.... Nothing out the ordinary. Nice one, I have done everything you have done. Please let me know how it goes. Good luck! Question about that dragon app. It says to have location services turned on the app can 'learn' about my device. So I have have to have 2 days of battery drain because of location services on before I can apparently start to save it? Hmm... it looks Android system is consuming most of the battery now I feel that the problem may be with the backup of battery not the .... do one thing remove the battery put it over to the flat smooth surface and try spinning it. If it spins then I am sure that its time to replace you battery and the problem will be sorted out once the battery is replaced otherwise I need to think more on this. Put the battery on a smooth, flat surface and spin it?? How does this determine if it's the problem? If it spins then it's swelling which is a problem, the battery is going bad. Had this happen to a couple of phones. You'll need to replace it. It only spins 1 and a half turns at the most. Well, if your battery starts spinning means the battery is swollen and needs to be replaced. This trick is mostly used by the customer support technicians to determine wether the battery needs to be replaced or not !! Why I know about is just because I have been active over many forums and I have some friends who are just expert at such ....so trust me and try spinning it over the flat smooth surface. I am trying to help you out here ! feel free to tell me if there's no need ! That's cool. I've just read up on it. It doesn't spin freely as such, once or twice becaise of the force I put into trying to spin it? Try reading more about "What drains your battery"
What makes my alarm go off is up until a week ago, I'd finish a working day with at least 80% battery... No change in usage etc etc and I now finish on 35-40%. I honestly don't know what it is learning from your location, so you can likely just not use the feature and see how it works for you. I keep my location services on power saving, which allows things like weather widgets to work properly, but does not drain as much battery as keeping the GPS on. See this screen here. It shows WiFi as being constantly on. It isn't because when I leave the house, I turn it off..... Could this be my problem? Should I do some form of wifi reset? EDIT- I have just seen that the 'always allow scanning even when wifi is off' option was ticked. Google location services search for wifi even tho its switched off or something? I've unticked it and hoping for the best. The dragon app has finished learning about my device. I have now uninstalled it as you need keep location services on for it to work. Really want to get to the bottom of this.... Really, really annoying. Can someone identify what phone model this Otterbox case goes with? Want to use Razr Maxx internationally, can I swap in Local Sim and create wifi hotspot?